The NHL Central Scouting Service released its annual midterm rankings ahead of the 2018 NHL Entry Draft in Dallas. 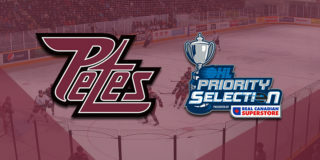 Three Petes players, including Declan Chisholm, Semyon Der-Arguchintsev, and Pavel Gogolev were named to the list along with one Petes prospect. Chisholm has recorded 2 goals and 12 assists for 14 points in 30 games played this season. 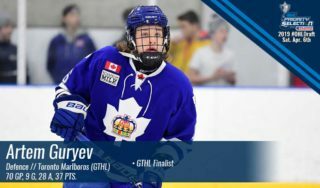 The 6’0”, 180lbs defenceman from Bowmanville, Ontario was ranked 42nd among North American skaters eligible for the draft. Der-Arguchintsev has registered 7 goals and 21 assists for 28 points in 46 games played this season. The 5’10”, 168lbs centre out of Moscow, Russia holds the 58th spot on Central Scouting’s midterm list. Gogolev has also amassed 28 points, composed of 17 goals and 11 assists in 44 games played. The 6’0”, 168lbs Moscow, Russia native was ranked 75th among eligible North American skaters. 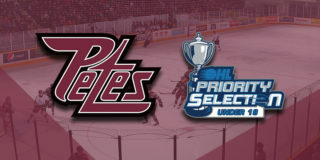 Also ranked was Petes prospect Logan Hutsko (Boston College – 123rd). The 2018 NHL Entry Draft takes place in Dallas, Texas, on June 22-23 at American Airlines Center. 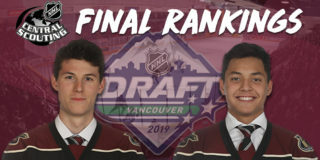 Peterborough’s roster currently features eight players selected in previous NHL Entry Drafts, including Nikita Korostelev (Toronto), Chris Paquette (Tampa Bay), Dylan Wells (Edmonton), Austin Osmanski (Buffalo), Zach Gallant (Detroit), and Cole Fraser (Detroit). 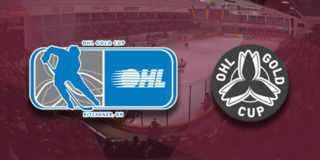 The Petes return to the PMC on Thursday, February 1 to host the Hamilton Bulldogs at 7:05pm. Game tickets are available starting at $8 through the Collins Barrow PMC Box Office, online or, by phone at (705) 743-3561.